Recovery and Treatment, Movie-nights for patients, Wine with lunch and Lasting friendships. In March 2018, twenty-four-year-old Emma Rietbergen was hit by a motorbike while out on a morning jog in the Philippines. After spending three weeks in a hospital in the Philippines, she was then brought back to Switzerland for medical care. She spent four weeks in the CHUV in Lausanne before being referred to the Clinique Romande de Réadaptation (CRR) in Sion for further treatment. The CRR is a national leader in orthopaedic and rehabilitative medicine. It houses up to 145 patients and employs more than 300 full-time staff, including doctors, nurses, physiotherapists and “ergotherapists” (occupational therapists). Although the bulk of treatment addresses in-patient needs, the clinic also offers outpatient services. Patients are admitted to the clinic for a wide variety of medical needs, including paraplegia, neurological conditions, and as in my case, recovery following an accident. Photo above – The CRR building in Sion. My experience of the care I received in Sion is overwhelmingly positive. I had one-on-one physiotherapy sessions twice daily; regular one-on-one ergotherapy; neuropsychology consultations; group exercise classes; pool-based therapy; continuous medical follow-up by a doctor; and a tailored gym programme. This full schedule of activities boosted me mentally as well as physically – there was a clear purpose of recovery and a specific strategy to follow. Every afternoon, I received my schedule of appointments for the following day. Therapies were scheduled between 08:00 and 18:00 Monday to Friday, and after the initial few weeks I was given the ‘get out of jail free’ card to go home at the weekends! 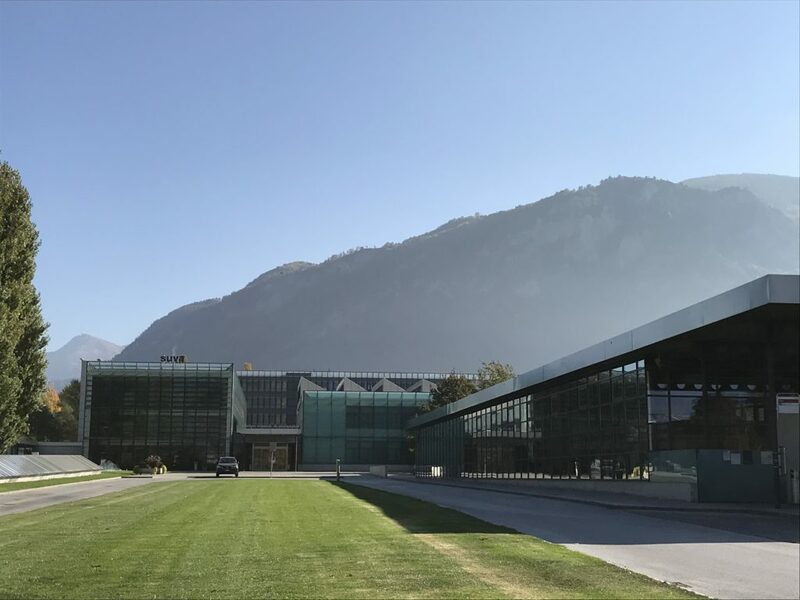 The clinic is located right beside (indeed is connected to) the Hôpital du Valais, so diagnostic procedures such as X-ray and MRIs can be performed essentially on-site if the need arises. However, the centre is also efficient in communicating with referring hospitals such as the CHUV, and takes charge of transport to such facilities for follow-up appointments with external medical staff. I am now all too familiar with the stretch of highway between Sion and Lausanne. 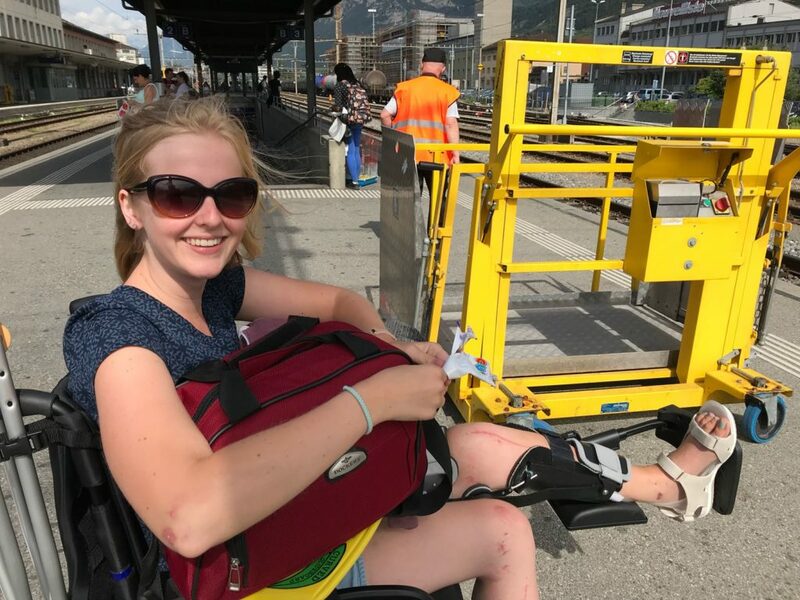 Photo above – Emma using the CFF rail network to go home between Geneva and Sion at the weekends. To request wheelchair assistance on CFF trains, you just need to call at least one hour in advance of a journey. More info here (in English). Although not every patient leaves the clinic with satisfactory improvements, I saw an impressive level of progress – I arrived bed-ridden and walked out on my own two feet! One of the aspects of my stint at the clinic that I enjoyed the most was getting to know other patients and staff. People in CRR are not afraid to address the nitty-gritty of less-than-ideal medical circumstances, yet also realize that there are other things to talk about in life. Shared respect of individual recovery processes and prognoses, combined with a suitably dark sense of humour, created an atmosphere where I felt supported but also autonomous in my “readaptation”. The clinic’s website quotes the average age of patients at CRR as 47 years old. At 24, I was one of the youngest during my stay, but I know in exceptional circumstances the clinic has accommodated patients under 18. Aside from a noticeably younger patient population than the hospital setting, the clinic also takes a different approach to health care delivery. The hospital system treats the patient like a garage would a car, viewing them as a total of their parts – some of which need fixing. Because the clinic aims to prepare their patients for reintegration into normal life, there is less room for dehumanisation, and treatment is more holistic. 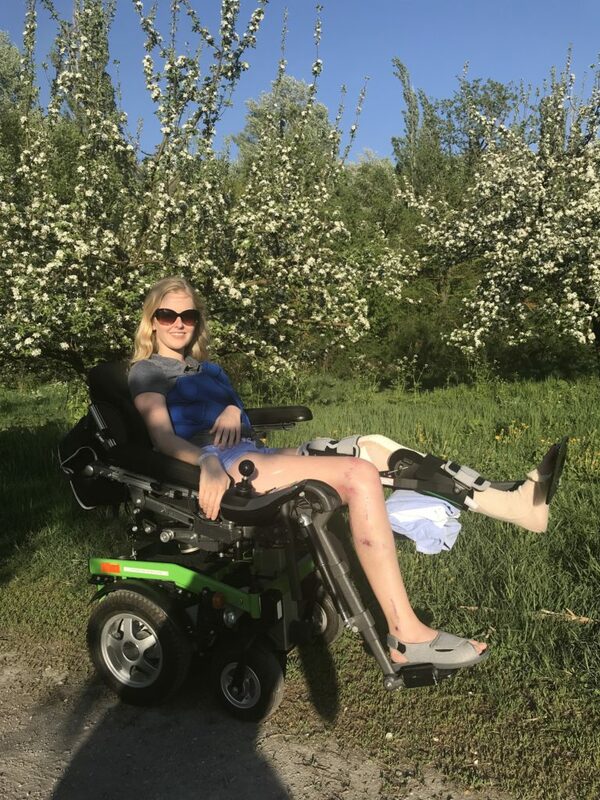 A case in point: in CHUV I was never allowed out of bed, whereas within 24 hours of arriving at CRR I was equipped with an electric wheelchair to get some long-awaited fresh air. In this vein, the clinic houses infrastructure for ‘extracurricular’ activities – there is an arts & crafts workshop with facilities for painting, pottery, and wood carving; table football and billiards; an outdoor mini-golf and table tennis; and movie nights twice weekly in a home cinema. There is also an outdoor picnic area with barbeque facilities, which we used often during the sunny Valaisan summer. The food is good too! Another “Valaisan” perk was the option for patients to enjoy some wine with their lunch or dinner. During the 2018 Football World Cup, we took our extracurricular activities offsite and went to the nearest bar terrace to watch the games, although for most of us it was more of an excuse for an outing rather than an informed interest in the sport. The CRR is a Suva establishment, and the link to the insurance business brings with it a focus on patients recuperating and returning to work as quickly as possible. A few members of staff had their own disability, including a nurse in a wheelchair. Unless they are privately insured, patients are two to a room, with a shared en-suite bathroom. Each person has their own sink and cupboards with a locked safe, a bedside table with drawers and a TV with attached headphones. A fast WiFi connection meant that Netflix was readily accessible! There are also several relatively swanky studio apartments in a newer wing of the building – I never got to the bottom of what criteria a patient needed to fulfil to secure one of those, but I can’t complain as I did benefit from a fondue soirée in one. In fact, repeated fondue soirées may have contributed to my regaining of muscle and non-muscle mass during my stay. The average length of stay in the clinic is 38 days – due to my considerably longer sojourn, I had plenty of time to get to know the staff and to make lasting friendships with other patients. I have been back to Sion several times on social visits since being discharged from the CRR, and I also keep in touch with fellow ex-patients in Geneva. The circumstances under which these relationships are formed are less than ideal, but lend them strength and meaningfulness. A friend who also attended the movie nights while I was at the clinic, is now discharged too, and we go to see movies together in the cinema! 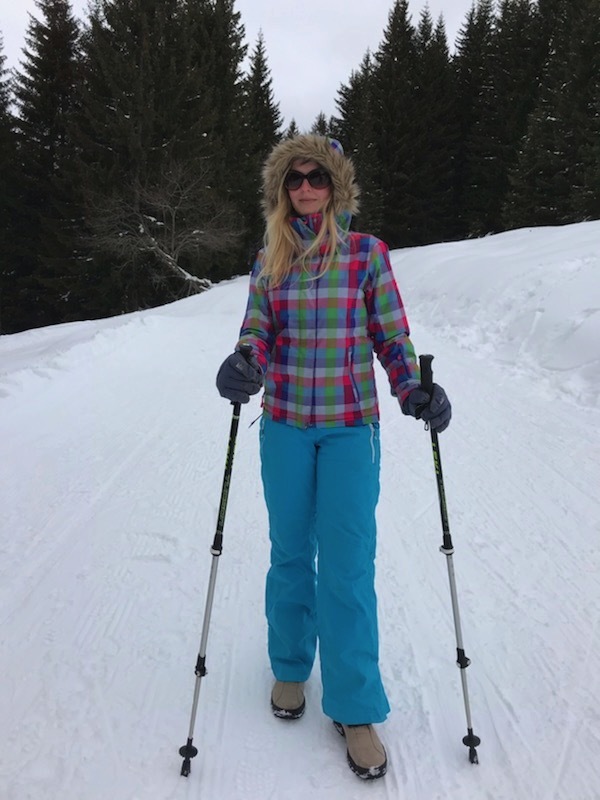 Emma is a third culture kid with an interest in global health, currently tasked with the recuperation of personal health in Geneva. Photo above – Emma Rietbergen.